The White Elephant Sale has been taking one person’s trash and recycling it into someone else’s treasure for more than 50 years. 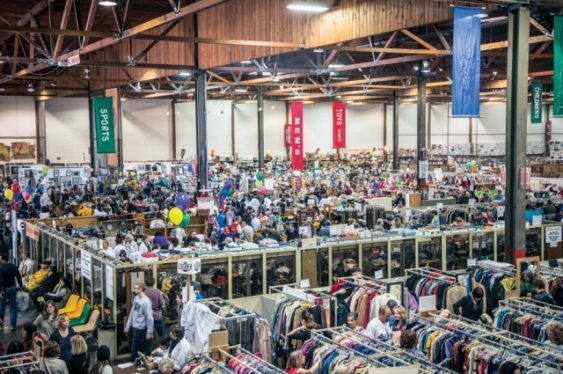 The White Elephant Sale is Northern California’s biggest and best rummage sale. The sale takes place in a 96,000-square-foot warehouse site at 333 Lancaster Street, near the Oakland Estuary. The celebrated rummage sale includes 20+ departments, offering a range of quality used goods including furniture, artwork, household items, china, sporting goods, fine jewelry, Asian collectibles, tools, music, books, vintage and contemporary clothing. Parking in the neighborhood is virtually impossible, so ride the free shuttle from Fruitvale BART that runs from 8:30 am to 5 pm on both days. Parking is free on the weekends. All proceeds benefit the Oakland Museum of California, including special exhibitions, educational programs, community celebrations, and Friday Nights at OMCA. You can also use the official rideshare partner Lyft. Enter the address (333 Lancaster St.) and the code OAKWES to get 20% off (max $5) for up to 4 rides. Valid until March 4, 2019 between 8 am and 5 pm.